Maldivian journalists have expressed grave concern over the disappearance of Minivan News journalist Ahmed Rilwan Abdulla and called for an end to intimidation of the press. In an unprecedented joint statement on Saturday, media outlets expressed solidarity and said Rilwan’s abduction is threat to all of Maldives. “Abduction and disappearance of individuals do not stop with journalists. This is a threat to every individual, every family and all of the Maldives,” the statement read. Efforts have been made by various parties to silence the press, including assault, murder attempts, vandalism of property and torching of TV stations, the statement noted. “Now, a journalist has disappeared without a trace. Information we have gathered so far strongly suggests Rilwan was abducted,” it said. The statement comes after several journalists from various media organisations spoke with eyewitnesses in Hulhumalé who claimed to have seen a man being forced into a car at knifepoint on the night of Rilwan’s disappearance. Today is the 15th day since Rilwan is believed to have gone missing. Both print and broadcast media signed the statement. They include Minivan News, Haveeru, Sun, CNM, Vaguthu, Dhuvas, Raajje TV, DhiTV, VTV, DhiFM, Channel One and Jazeera TV. Media groups noted the state has failed to take adequate action against those who intimidate the press. “As intimidation of press grows, and attacks against journalists, equipment, and buildings continue, we are extremely concerned over the delays in bringing to justice those who commit these acts. We note that the investigation of Rilwan’s case is slow and that information has not been adequately shared with the media and the public,” the statement said. No one has been prosecuted for the October torching of Raajje TV, while two years have passed since charges were pressed against two individuals suspected of assaulting Raajje TV journalist Ibrahim ‘Asward’ Waheed. The state’s failure to end press intimidation allows extremism of all forms to grow stronger, the statement added. The Maldives Police Services have pledged to treat Rilwan’s disappearance as a “top priority case” and said the army is now assisting the police in their search. Police have failed to reveal details of the investigation. 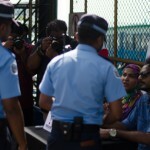 In a May report, the Maldives Broadcasting Commission said 84 percent of reporters in the Maldives have reported being threatened at least once, often by political parties, gangs and religious extremists. Media groups today urged the state to make the relevant policies to ensure the right to live and work without fear is enjoyed by all Maldivians. “Even though different media outlets have different editorial policies, we, all journalists, are one family,” the statement said. 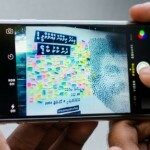 Media groups have set up a committee to pressure the state to expedite investigations into Rilwan’s disappearance and end intimidation of the press. Planned activities include meetings with stakeholders on Rilwan’s disappearance, increased coverage and talk shows about the threats against media. International groups, including the Office for the United Nations Commissioner for Human Rights (OCHR) and Reporters Without Borders have called for a speedy and thorough investigation. The New York based Committee to Protect Journalists urged the authorities “to leave no stone unturned” in their efforts to find him. The spun-masterpiece of hereafter heavens are the threat to Mordis and the world. The reality is here, on this earth, living now. Why can't the goatees see this? The supposed permanent residence/destination is causing the disillusioned, to make incredibly stupid desicions harming everyone else. If this was done for religion and country, those who are responsible for this abduction are sick to their guts. No one has more rights to religion or country more than anyone else. The only birth right you have on the planet is your mother’s womb, if you can’t protect that from decaying and ultimately vanishing from the face of earth, why on earth you think you have to more worry about the geographic region where you appended to take your first breath. The coconut trees and mangroves have more right on you your palm tree infested sand dunes then you, because their mother is this soil. Rilwan's abduction is not just a threat to media. It is a threat to all citizens and our way of life. It is a threat to our freedom to live our lives without harrassment. Those that cannot be manipulated in conforming will be terrorized into doing so. Our Police are have shown a combination of incredible incompetence and unwilligness to tackle the issue. Their lack of professionalism is dangerous because those that abducted Rilwan will not stop with him. Soon the police will become targets too. "Their lack of professionalism is dangerous because those that abducted Rilwan will not stop with him. Soon the police will become targets too." This may be a reason as to why the Police Force is reluctant. But this is no reason, or is not a good enough excuse! But when it comes to the reality of assaulting, brutalizing and destroying, they have been seen damn ready, well versed and well equipped! Islamic Minister of Maldives Denounces ISIS activities in the Maldives on Twitter. the first step by president Yameen..
next will be the Hunt , and then extremism in maldives will be forever forgotten, we r looking at a beautiful futures for the maldivians. With the coming of SEZ and economical security everything will be alrite. have faith.